Until we saw these cupcakes we did not think it possible to do a good cupcake Stonehenge. But this–this is outstanding! Unsurprisingly, it was made in the Stonehenge State, in what could well be the Stonehenge replica capital of the world, Seattle Washington, the city we want to live in. What makes this good? The green icing, grey stones, correct or nearly correct proportions, even stone shaping and texturing. What else, class? Yes, that is right–the inner trilithon horseshoe faces the three lintel stretch in what remains of the outside circle. The only thing that would tempt us to subtract druids is that we were not offered a taste. Still, this is magnificent. Even the blue stones are included. The artist really looked at Stonehenge and tried to make this a true replica. We are impressed. Score: 7½ druids or 9+ druid dwarfs. Well done! That ends our speed posts for this week. If we should indeed perish, many many Stonehenge replicas would never get posted (unless some brave soul picked up the torch), and the world would probably be better for that. But chances are, next week we will be back trying your patience with more nonsense and tracking the Stonehenge-building virus as it ripples through the world population. Until then, fair folk, happy henging! And wish us luck. Just sent in yesterday by friend of the blog John Shaw-Rimmington, the thinking stone man, dry stone walling genius, and blogger at Thinking With My Hands. You see, in the US and Canada banks hand out these variously-sized paper tubes to people who have large amounts of loose coin. The coin owner then fills the tubes with the correct sized coins. A roll of nickels, for example, is $2.00. A roll of pennies is 50 cents, and so on. “My daughter has been collecting lots of her ( and ours, that we lent her ) change over the last few years and yesterday she wrapped it all. She thinks it’s hers now. The brown paper tubes when they’re neatly packed are remarkably heavy and feel like they want to be stacked somehow. So I made a little free-standing coin circle. Or would that be a high priced one? I will call it Coinhenge perhaps? I think that I had the Clonehenge site in mind when I made it.” See how he added that bit about us in order to avoid being castigated for his terrible puns? Aargh! *strangled groan* The bun is the lowest form of wheat, if you get our drift. However this is the perfect henge for these times of change. Hurhur. We award it 6 druids, one whole druid of which is due strictly to John’s longstanding friendship with this blog. Please, if anyone is considering hiring him to do drystone work, we assure you that his expertise and art in that field are far superior to his pun-making and henging! He does beautiful work. Spamhenge–May Last Longer Than the Original! This is not the only spamhenge, but it is a famous spamhenge, famous enough to have been a clue on the television game show Jeopardy. Yes, that’s right–Alex Trebek broached the esoteric topic of Stonehenge replicas on his show one fateful night! And we heard it. Considering it is a spamhenge, it is rather well done. The stone shapes are correctly proportional and they have aimed the opening of the inner trilithon horseshoe toward the three lintel stretch in the outer circle. That counts for a lot as we said last week. We give this 7 druids, partly for the choice of material. Odd materials are in the Clonehenge tradition! We believe this was created for the 7th Annual Chicago Spam Sculpture Contest. Which raises a lot of questions in itself. But on to our next Speedpost©! OMG! We have a hurricane headed straight for us! This made us stop and think–what if we perished? What Stonehenge replicas would we be most sorry about not posting? A few came to mind, so today instead of doing a long post, we’ll do a few short ones. This is a long-sought miniature Stonehenge that we saw a picture of when we first started out, a picture that did not say where this was. We finally know this is part of another park full of miniature world landmarks and buildings, Miniature World, formerly Miniatura Park, in Cornwall. The park is now closed, but people are working to reopen it to tourists. We can’t see this replica well enough to judge it, but it looks like a 7½ druid circle, give or take a half druid. Not sure why, but we like that it’s on the little hill. Yay! Finally posted it. Ooh, ha ha ha! First we have to catch our breath from laughing at our clever title. I’m sure that’s why we’re alone all of the time–people are afraid they would die laughing because of how funny we are. Anyway, apparently there is this. 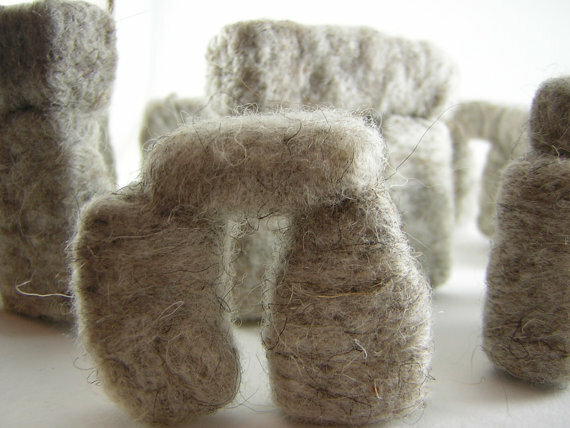 When you think Stonehenge replica, it’s true that you don’t think of wool right away as a suitable material, but there is a certain logic to it. So many people who go to Stonehenge end up taking at least one picture of sheep, or making a joke about the sheep henge that is set up right near the stone henge. Sheep are very much a part of the Stonehenge experience. The Etsy page says, “…what you see here is a model of Stonehenge depicted in wool, I used photographs from a book and my own pictures to try and depict many of the rocks’ crevices. The real Stonehenge is 24 feet (7.3 m) tall and made of stone but the tallest of these stones is 2.5 inches (3.5 cm) tall and made of wool, so it’s lightweight and portable. We have to enter the modern world, we know, and get used to things like seeing the word gift used as a verb. But once we’re past that there are the sheep who eat mainly seaweed to distract us. Visions of aquatic sheep arise, with webbed hooves and gills, herds of them bobbing on the waves like rubber duckies… Does this have to do with the Japanese radiation? No? Too soon? But the part we need to focus on here is “I used photographs from a book and my own pictures to try and depict many of the rocks’ crevices.” Not only has she taken care to place the stones roughly as they stand today (inner trilithon horseshoe facing the three consecutive extant lintels. We look for that in a replica), but she noticed their shapes and made a stab at that as well. We believe we recognise the individual stones in the second picture above. That is rather advanced for a very small replica. We also note that she nowhere mentions druids! Well done. All in all, a superior small replica. Score: 7 druids. Although as Faithful Reader Simon Burrow pointed out, we should almost have a separate category of druid for the small henges, which tend to be scored lower just because they’re small. Okay, Simon, this would get 8½ druid dwarves! And a spell of transmutation. No, no. This is not an RPG. Yet. Wool–another material added to the list, taking us ever closer to Rule 34S. If you think of some odd new way or place to make a Stonehenge replica, let us know. And until then, friends, happy henging! One of our highly paid and intensively trained henge-spotters* was on duty in Atlanta Georgia recently and spotted this Stonehenge sculpture fountain, entitled Stonehenge 2000. Unfortunately we know very little else about it. It was created by Blood, Sweat, and Steel sculpture shop, under the leadership of an Alex H. with the help of someone named either Chip or Dan, who now works at Etowah Iron Works. Who commissioned it and why the reference to Stonehenge is a mystery. If any readers know or find further information about it, please write to us or put it in the comments so we can add it to the post! Stonehenge sculptures are not unusual. People who do large sculptures seem to use Stonehenge as a sort of fall-back idea. Stonehenge fountains are not so easy to find. Offhand we can think of the Notre Dame fountain, one of the sculptures at Caelum Moor in Texas, the one at Falling Water Designs in Monroe, Washington, and possibly the odd Stonehenge in Mountain View California, although we’ still don’t know about that one. And then there’s that Waterfall fountain trilithon we posted that time–probably better forgotten. But why make a Stonehenge fountain at all, one might ask. Just one of those mysteries of the human mind, we suppose. Someone thinking, “Stonehenge is brilliant, but it would have been perfect if it were a water feature!” A surprising number of hengers feel deep down that they could do better than Stonehenge’s original builders. Before we go, we’re going to throw in another Stonehenge-related sculpture that has been lurking on our backlog list for a long time: Toronto’s Gateway to Understanding. The text on a Flickr page showing a picture of it reads, “The Gateway to Understanding, Harbourfront, Toronto, ON. To commemorate the Earth Spirit Festival held in July 1991. Through dialogue and cultural exchange, tolerance and understanding awaken within us. This structure will stand tall and bold as a symbol of the earth spirit. By David Ruben Piqtoukun.” He is an Inuit artist and we get the sense he is using the trilithon form for its portal/gate qualities more than as a Stonehenge replica, but we thought it deserved a mention. And we like the idea of the rough stone trilithon as a symbol of the earth spirit. That may be what that grey original huddled on Salisbury Plain was all about, (even if it was longing for some water to be pumped through it!). There are more Stonehenge sculptures and we may get to more of them over time. For now we will be pondering whether to add these two to the list of Large Permanent Replicas. Input is welcome, but we will probably at least add the Atlanta fountain one of these days when we’re feeling less lazy. And, of course, in the meantime, friends, happy henging! *Or– maybe it was friend of the blog Simon Burrow stumbling across it on an unrelated business trip…despite all the money we waste on those henge spotters! But while EH has dithered, with frequent changes of status for the project of building the new visitors’ center and altering the landscape, Ms. de Forest has gone ahead, as artists will, and created engaging art from the cognitive dissonance between the tacky car park and related facilities on one hand, and the ancient and mystical world treasure that is Stonehenge on the other. What is the question we’re waiting for, class? Yes, you over there in the “Give Me That Old Time Religion” t-shirt with a picture of people dancing around Stonehenge–Very good. The question is, what is pinhole photography? You can find a very thoughtful explanation by Bethany de Forest here. Or you can read ours as follows: Well, you kind of like, stick a hole in something, ya know? And then ya like put it in a little box, then make a little model, then you, like, let the light in or whatever. And then it looks like Stonehenge. Or, like, whatever, ya know? We’re pretty certain that 150x150m measurement was a typo, but then her website does say that, “Being a pinhole photographer, Bethany’s view of the world is quite deformed.” AND she lives in Amsterdam, so all bets are off. As for English Heritage, the proposals given on their site for returning to Stonehenge some of its dignity sound brilliant, in our not-nearly-as-humble-as-it-should-be opinion. That nearby overly-large car park would be gone. Whether any of those changes ever happen is another matter. We got stuck in buffering limbo just trying to see the last 30 seconds of the EH video on that page. It may be an omen. Someone said to us that as December 21, 2012 approaches, more and more people will be compulsively building Stonehenges. Apparently it has to do with vibes coming out of the earth and others reflecting back from the future or something. We don’t understand all of that, but we warn everyone to remain alert. The Stonehenge brain virus is pandemic, and so far the medical profession is treating it as if it is a tick disease, by which we mean ignoring it altogether. No one is safe.